A highly respected trial attorney in the courts of Macomb, Wayne, Oakland, and St. Clair Counties, James A. Tanielian holds an of counsel position with Femminineo Attorneys. His primary areas of focus are workers compensation, unemployment compensation appeals, and social security appeals, as well as auto accident and personal injury cases. Mr. Tanielian brings to Femminineo Attorneys a broad dimension of expertise in his areas of specialization, along with 30 years of experience practicing law. He has handled hundreds of cases in Michigan Courts, including the Michigan Court of Appeals and the Michigan State Supreme Court. Mr. Tanielian graduated with honors from Michigan State University with a Bachelor of Science degree. He earned his J.D. from the Detroit College of Law and has been an active member of the State Bar of Michigan since 1966. 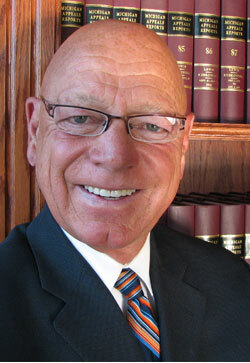 A member of the Macomb Bar Association, the State Bar of Michigan, and the Michigan Trial Lawyers Association, Mr. Tanielian previously owned and operated his own private law firm, working with and teaching dozens of lawyers how to practice law effectively and properly in the State of Michigan.